Today at 10AM local time, students across America walked out of their classes for 17 minutes, in memoriam of the 17 students murdered in the Parkland massacre at Marjory Stoneman Douglas High School in Parkland, Florida, exactly one month ago. The walkout was led by student activists in a movement that started within hours of the Parkland shootings, as survivors of the shooting decided that they would not allow "thoughts and prayers" be all that their friends' blood would buy from lawmakers. 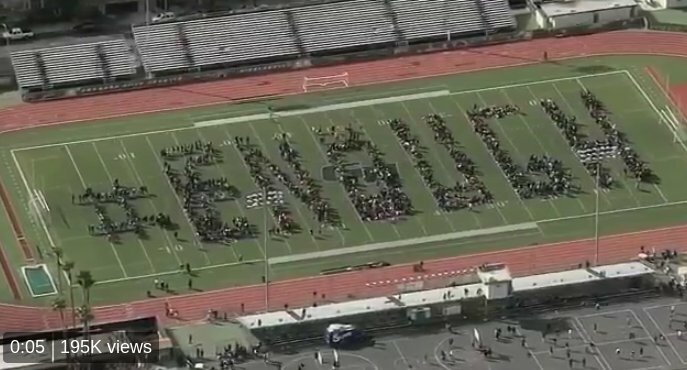 Students at some 3,000 schools across the USA walked out. The ACLU provided legal advice to students at public schools who feared administration reprisals; school administrators largely cooperated, though some tried to reframe the protests as "public safety events." Here are the names of the dead: Alyssa Alhadeff, 14. Scott Beigel, 35. Martin Duque, 14. Nicholas Dworet, 17. Aaron Feis, 37. Jaime Guttenberg, 14. Chris Hixon, 49. Luke Hoyer, 15. Cara Loughran, 14. Gina Montalto, 14. Joaquin Oliver, 17. Alaina Petty, 14. Meadow Pollack, 18. Helena Ramsay, 17. Alex Schachter, 14. Carmen Schentrup, 16. Peter Wang, 15. I will not republish the name of the killer. • The demonstrations were not limited to school property. In New York, students marched in the streets, while in Washington, sign-clutching students gathered outside the White House and on Capitol Hill. • It is unlikely that officials in Washington will quickly heed the demands of the students. Although Florida last week raised the minimum age to purchase a firearm to 21 and extended the waiting period to three days, President Trump on Monday abandoned his pledge to seek national-level reforms that the National Rifle Association opposed.